Nephi is the fourth son of the prophet Lehi. He is the author of the first two books in the Book of Mormon. 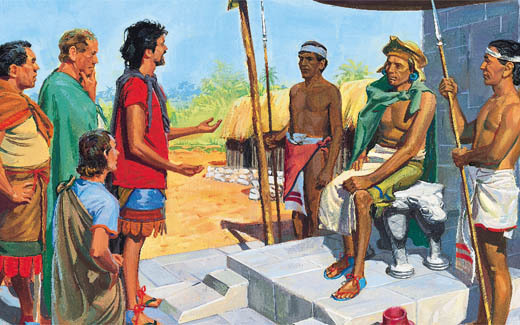 Nephi begins his story (around 600 B.C.) describing the holy calling of his father as a prophet of God. 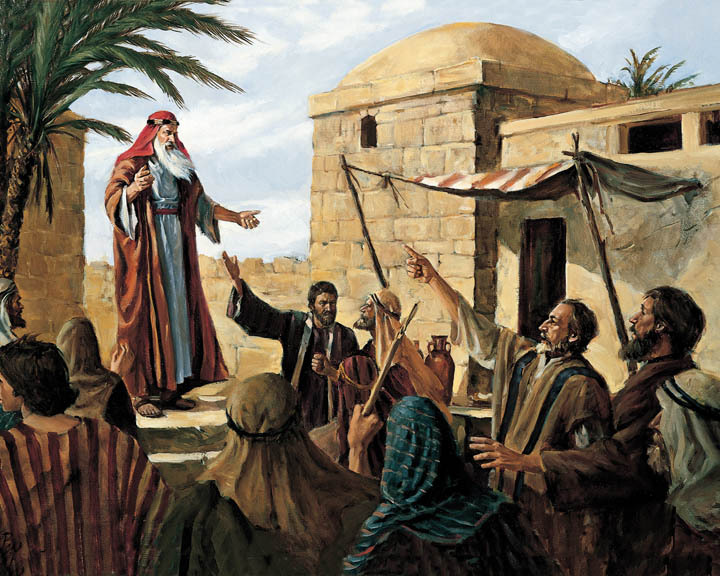 In preaching to the people of Jerusalem, where they live, Lehi is rejected, and the Lord commands him to flee into the wilderness with his family. After three days’ travel into the wilderness toward the Red Sea, the family settles in an isolated valley with a running stream. Nephi and his older brothers are sent back to Jerusalem to obtain a set of scriptures engraved on brass plates. Only Nephi refrains from murmuring against his father or the Lord. Twice, the brothers fail at obtaining the sacred writings. On the third attempt, Nephi enters alone into Jerusalem at night. He encounters the keeper of the record, Laban, drunk in an alley. The Spirit of the Lord commands Nephi to slay him, and Nephi, although reticent, obeys. He then dresses himself as Laban, and is able to obtain the brass plates. Later they are sent back to Jerusalem to invite the family of Ishmael to join them, wherein the brothers each find a wife among Ishmael’s daughters. As with Joseph and his father Jacob in the Bible, Nephi is the obedient son and chosen to receive the birthright, even though he is not the oldest. His older brothers Laman and Lemuel often plot his death, but through the Lord’s protection, Nephi is delivered time and again from them. The family travels along the ancient Spice Trail by the Red Sea, and then turns east. During their travels they often suffer hunger, thirst and danger. At one point, Nephi’s bow breaks, which is a challenge, as the other bows have lost their spring. As they cannot find food, hunger leads the family to murmur against God. Nephi shows himself to be the obedient servant of God. He makes a bow and arrow from wood, then asks his father to pray to God to see where he should go to obtain food. The Lord leads Nephi to obtain food for the family, and they humble themselves. Arriving at the ocean, the Lord commands Nephi to build a ship to travel to the Promised Land. Nephi only asks where he can find ore, so that he can make tools to build the ship. 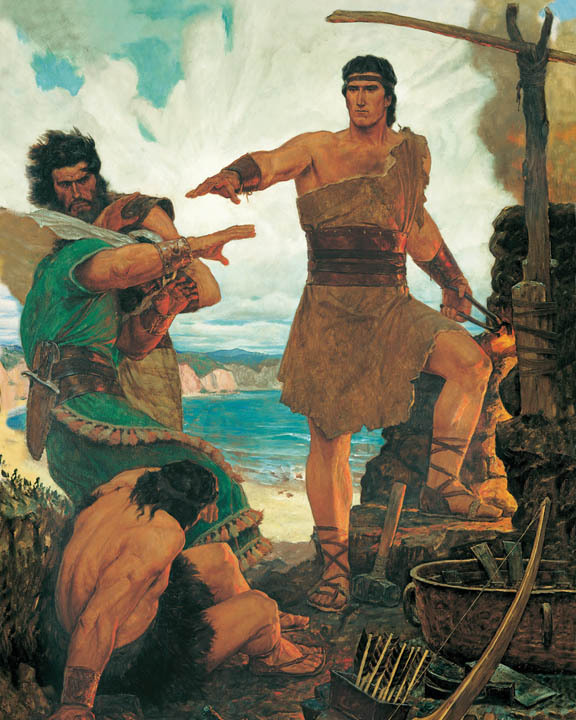 His brothers laugh at him when Nephi asks them to assist. The Lord fills Nephi with power, and in touching his brethren, they receive a shock that knocks them to the ground. They see that God has empowered Nephi, and they begin helping him build the ship. During the ocean crossing, Laman, Lemuel and others begin to party in a vulgar manner. Nephi objects and they bind him to the mast of the ship. Storms begin that throw the ship off course. For four days Laman and Lemuel try to command the ship, but it will not respond in the face of the storm. We are told that only in the face of certain destruction do they humble themselves and loosen Nephi’s bands. He prays to the Lord, who ends the storms and allows them to arrive safely to the Promised Land. 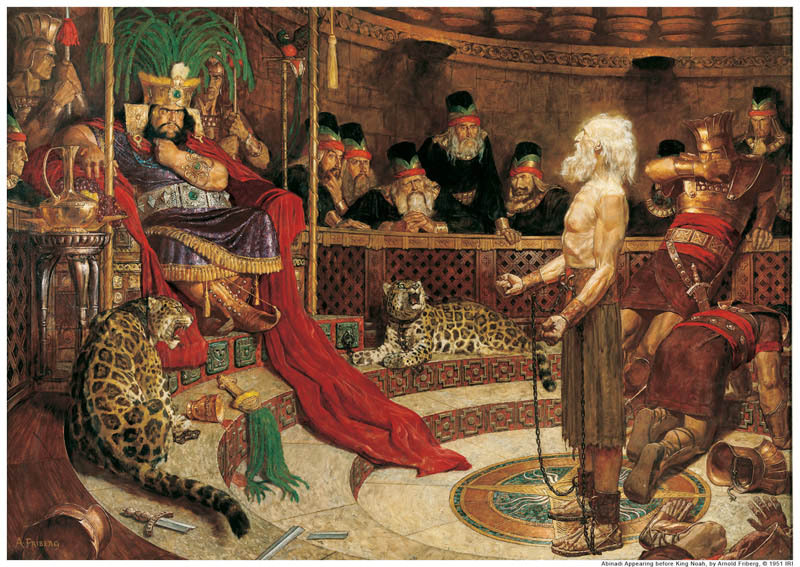 In the new land, Lehi instructs that Nephi shall be the ruler of the people. Soon after Lehi’s death, Laman, Lemuel and others in the group decide to overthrow Nephi. He is warned in a dream, and takes the believers with him to another location. Nephi builds a temple similar to Solomon’s temple. He finishes his record sharing important gospel teachings, including writings from isaiah and his younger brother, Jacob, who was also a prophet. 1. In one grand vision, Nephi sees what is called the Vision of the Tree of Life. His father Lehi had a vision of the Tree of Life, and Nephi also desired to know the things his father had seen. While meditating and praying on it, he was caught up to a high mountain and saw his father’s vision. In the vision, the Holy Spirit guides him through a sequence of symbolic manifestations. He sees the lowly world, represented by a great and spacious building of the proud and rebellious, mocking the righteous. Other wicked were wandering off into mists of darkness, strange paths, and a river of filth. He sees (as did Jacob of old) a path or staircase with a banister of iron (the Iron Rod is the Word of God) leading upward to heaven. In this instance, heaven is symbolized by the Tree of Life, and the white fruit is the atonement of Christ, which is shed upon all who will receive it. The fruit of the Tree of Life symbolizes a holy supper for those willing to receive the covenant of Christ. After seeing the Tree of Life, Nephi then sees the life of Christ, from His virgin birth to His death on the cross. He is told this is the condescension of God, as Christ descends below all things to save mankind. Nephi then sees the resurrected Christ. His vision moves forward, showing him the future of the Nephite nation, with its periods of righteousness and wickedness. He sees that the resurrected Christ would visit his descendants, and they would become a holy people for several generations. Eventually, they would rebel against their witness of Jesus, and be destroyed for embracing evil. Nephi notes that he cannot share all things he has seen, as many of them would also be witnessed by the apostle John, who had the responsibility to write his Revelation to the world. 2. Nephi also taught important concepts regarding Christ and His atonement. He noted the importance of witnesses, and so writes the last portion of his second book in conjunction with three witnesses of Christ: his brother Jacob, Isaiah, and himself. He quotes both Jacob and Isaiah to demonstrate the covenant of Israel with Christ, and how it applied to his own people, the Nephites. Major studies have been done in conjunction with this, showing Nephi clearly had a deep understanding of how the covenant worked with Israel and God. 3. Nephi sets a symbolic pattern throughout his writings of Creation, Fall, Atonement, Covenant/Ordinance, and Returning to the Presence of the Lord. We see a major example of this as follows: 1) He shares the creation of his family; 2) Laman and Lemuel rebel and are “cast out of the presence of the Lord”; 3) Nephi shares the teachings of Jacob and Isaiah to demonstrate the Atonement of Christ for Israel, the Gentiles, and us as individuals; 4) He discusses the covenant we make at baptism; and 5) how all of this leads to us returning to God’s presence. Keith L. Brown is a convert to The Church of Jesus Christ of Latter-day Saints, having been born and raised Baptist. He was studying to be a Baptist minister at the time of his conversion to the LDS faith. He was baptized on 10 March 1998 in Reykjavik, Iceland while serving on active duty in the United States Navy in Keflavic, Iceland. He currently serves as the First Assistant to the High Priest Group for the Annapolis, Maryland Ward. He is a 30-year honorably retired United States Navy Veteran. Copyright © 2017 The Book of Mormon. All Rights Reserved. Copyright © 2019 The Book of Mormon. All Rights Reserved.